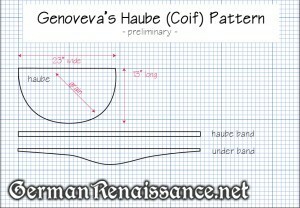 The haube band would be sewn to the straight side of the haube itself, which would start at the top of the head (a bit back from the hairline) and tie at the bottom back of the head. 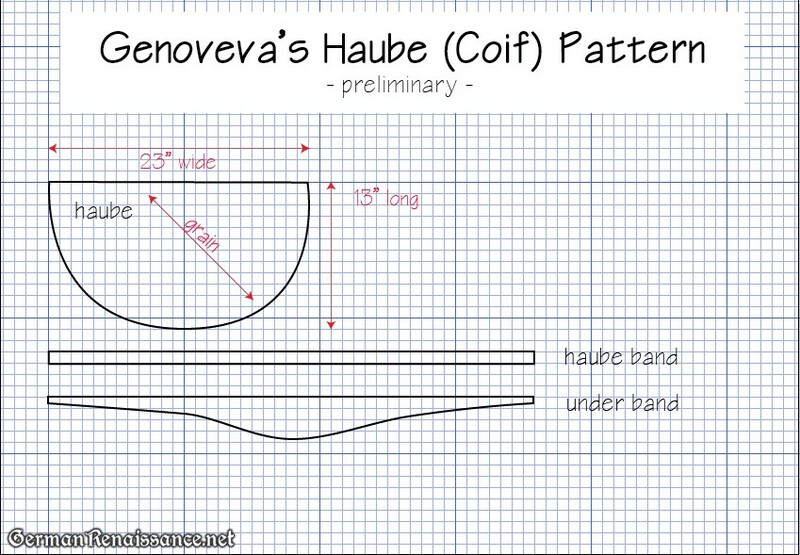 The rounded part of the haube would be gathered (or smocked?). The under band would go across the top of the head at the hairline and tie at the bottom back of the head. It goes on the head first, then the haube goes over it, covering the top and back of the head. And the reason for the grain line is that I found that cutting the haube on the bias allowed the material to stretch over the braids on the sides of the heads in a more fluid manner. It would also explain why I see pearls applied at 45° angles to the line of the haube — they would be along the warp and weft lines of the fabric then. I’m continuing to seek feedback before I proceed! I think you’ve solved the problem. What kind of fabric would you use for the under and? Do you have any suggestions on where to find suitable gold silk for the haube? I’m not thrilled with the brocade I bought on Ebay and I don’t want to use Duponi, it is too slubby. I used a linen interlining and a linen lining. I found the red-gold silk taffeta I used for this project at http://www.renaissancefabrics.net/product/silk/silk-taffeta-golden-sunset/ (1 yard). I’m working on the write up of my finished goldhaube now, so look for that!